Prime Minister Justin Trudeau took his so-called progressive trade agenda to the United States on Tuesday, arguing that worker-friendly policies are key to saving public support for free trade. He made that case in a speech as he arrived in New York for the United Nations General Assembly and was presented an award for global citizenship by the Atlantic Council think tank. Trudeau was introduced to the stage by Jordan's Queen Rania who saluted his values and his work on Syrian refugees. The prime minister noted that some critics at home have made fun of his government for pushing chapters on gender equality, Indigenous rights, and labour protections as priorities for a new North American Free Trade Agreement under the argument that these things have nothing to do with trade. But he suggested this is no laughing matter for anyone who cares about preserving trade, in an era when populist currents have threatened to topple international agreements in Europe, Asia and North America. "It's as though they expect us to do trade exactly the same way it was done by our parents, a quarter century ago." He said trade deals have been broadly positive for the majority of citizens, but if they were perfect there would be no populist backlash like the ones currently occurring, especially in former manufacturing regions slammed by offshoring and automation. "So we need to do a better job of ensuring the benefits of trade extend to the middle class and those working hard to join the middle class — not just the wealthiest few," Trudeau said. "In short, progressive trade is not a frill. In addition to being the right thing to do, it is a practical necessity, without which popular support for a growth agenda cannot be maintained." He noted as an example the push for labour rights. Sources say the Canadian government hopes the new NAFTA includes stronger union protections for Mexican workers, and an end to U.S. right-to-work laws that limit the potential to strike. Sources say some of these ideas have swiftly been deemed non-starters by the other NAFTA parties. 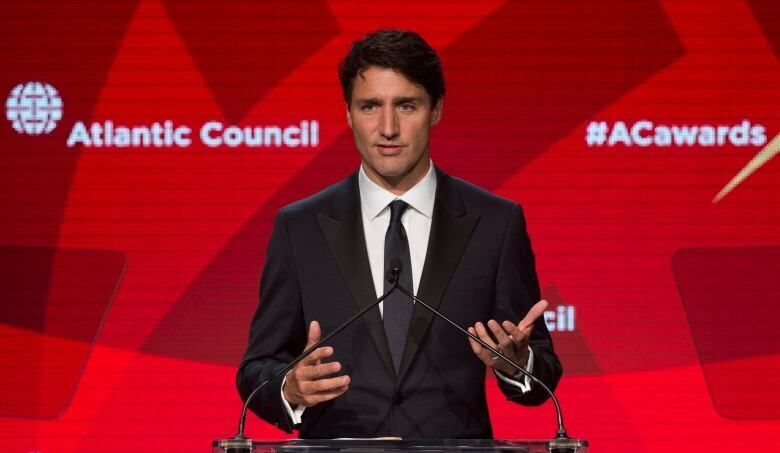 Trudeau delivered his speech on an aircraft carrier in the Hudson River where the black-tie Atlantic Council gala was held. The speech included three themes: progressive trade, promoting human rights, and preserving the post-Second World War multilateral order. Some of those post-war institutions have come under attack recently by President Donald Trump, who argues that the U.S. pays too much into organizations like NATO and the United Nations and gets too little out of them. It was a common theme of Trump's speech to the General Assembly Tuesday — he toasted the merits of nationalism, and the idea that countries should be free exercise their own sovereignty. But the prime minister said that on common challenges like climate change, income inequality, terrorism, civil war and mass migration, international institutions are indispensable. 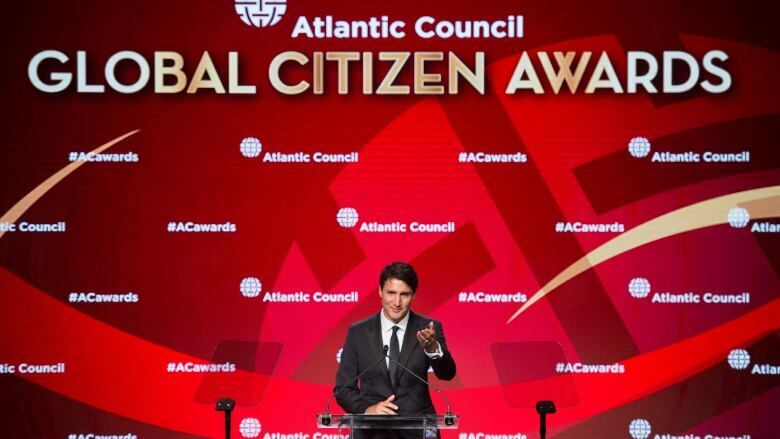 "Alliances that have underpinned global security and prosperity since 1945 are being put to the test," Trudeau said. "Worldwide, the long-established international order is being tested. With Russia's illegal annexation of Crimea and encroachment in Ukraine, we have seen the first major territorial seizure in Europe since the Second World War. "This is not the time for retrenchment. It is a time for the Atlantic democracies to renew our commitment to universal standards of rights and liberty, enforced through a multilateral, rules-based order that has promoted peace and stability, and stood the test of time." He said that includes NATO and the UN, Norad, and the World Trade Organization, spanning both soft and hard power, which is why Canada is also significantly boosting its defence spending. The Jordanian queen saluted the prime minister as he stepped up to the stage for his award. "We live in an era of shrinking trust in government institutions," Rania told the audience. "But every once in a while a leader steps up onto the stage and reignites our faith … As Canada celebrates its 150th anniversary, Mr. Trudeau has led his country in renewing its deepest values: the openness, generosity, big-heartedness and broad-mindedness for which Canadians are admired across the globe." IMF president Christine Lagarde spoke after Trudeau to introduce the second award recipient, South Korean president Moon Jae-in. Lagarde joked that her friend, Trudeau, was a tough act to follow. Trudeau and South Korea's leader met before the event and discussed the nuclear crisis to its north.